Nestling in a picturesque bay on Scotland's west coast with breathtaking views of the mountains of Mull and surrounding islands, Oban is easily reached by car, bus and train. Known as the Gateway to the Isles, Oban is a major ferry port and an ideal touring base for a West Highland holiday. Visitors to Oban can experience a whole range of activities, as well as enjoy trips to South Argyll, Glencoe, Fort William, Inveraray and the islands of Mull, Iona, Tiree, Barra and more... the list is endless. 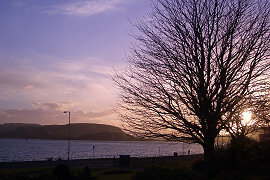 Oban offers a good choice of shops, restaurants, pubs and eating places, many within easy walking distance of Greencourt. Below are a number of suggestions for days out from Oban, and these are just a few of the many possibilities for visitors to the area. Greencourt has a wide selection of maps, timetables and leaflets in the hall and dining-room. During your stay, please feel free to ask us for help in planning your trips. Also see our links page for details of lots of other activities and things to do. These islands - and in particular the historic island of Iona - attract many visitors each year, and no holiday in Oban is complete without a day on Mull and Iona. There are several tour companies operating quality and competitively priced all-inclusive tours, and information leaflets on these are available at Greencourt. Alternatively you may wish to 'do your own thing' and go to Mull by car or take the local buses around the island. Information and timetables are also available at Greencourt. Birdwatchers and wildlife enthusiasts can enjoy seeing puffins, seals, and many types of seabirds at very close hand, especially on Staffa and the Treshnish Isles. For others the peace and spirituality of the ancient Abbey on Iona make for a memorable trip. Music lovers will appreciate Mendelssohn's 'Hebridean Overture' all the more when they see the island of Staffa, which provided the composer's inspiration for the work. Whatever type of trip you plan, it's best to book in advance to avoid disappointment. Tickets for the organised trips should be purchased and collected by 9.30am at the latest on the day of travel from the various ticket offices in the town. Tobermory - or Balamory as it has become famous through the popular children's BBC television programme - is the main town on Mull and is situated in the north east of the island about an hour's drive from the ferry terminal. A visit to Tobermory, which nestles around a pretty bay and is a haven for sailors, is a must for anyone doing a tour of the island by car or by scheduled bus. The villages of Salen and Dervaig are also interesting and worth a visit with some spectacular scenery on the way. The beautiful fertile island of Lismore lies to the north of Oban and is well worth a day's exploration by foot or bicycle. A ferry goes from Oban at regular times most days and there is also a small passenger ferry to the north end of the island from Port Appin, which is about 20 miles north of Oban by car or bus. Visitors may wish to drive or take the scheduled bus to Appin, walk/cycle the couple of miles to the ferry at Port Appin, cross over to Lismore and spend the rest of the day walking/cycling the nine miles south to catch a ferry back to Oban. Some sunshine and a picnic lunch make for a perfect day trip. A stone's throw from Oban, the island of Kerrera lies at the opposite side of Oban Bay, and is a haven of peace yet so close to the town. Make your way to the ½-hourly ferry about a mile from the south edge of the town round the coast, and enjoy some great scenery and walking on the island. To the south of Kerrera you will find a delightful award-winning tea garden offering delicious snacks, lunches and afternoon teas featuring fruit, flowers and vegetables grown on the island. Alternatively take a picnic, climb over to the west coast, find a quiet spot (not difficult!) and enjoy uninterrupted views of Mull, Lismore and Ardnamurchan. Explore one of the bonniest lochs in Scotland with the mountains of Glencoe as the backdrop. This loch is not fully accessible by road from Oban, so the cruise which departs from Taynuilt allows you to travel far up the loch towards Glencoe and Glen Etive. With a friendly, knowledgeable boatman and reasonably priced tickets, this is a relaxing enjoyable way to spend three hours. Around 35 miles from Oban, Inveraray - with its famous castle and historic jail - is well worth a day visit from Oban. The seat of the Dukes of Argyll, the castle offers guided tours, as does the jail. Travel directly to Inveraray on the A85 or make a real trip of it, by heading south from Oban via the Crinan Canal to the lovely fishing village of Tarbert and travelling up Loch Fyne to Inveraray, completing the circle to Oban on the A85. Enjoy a beautiful corner of Argyll not far south of Oban and cross over the only 'Bridge Over the Atlantic' to Easdale and Seil Island. An excellent folk museum relates the history of the area, in particular the famous slate quarrying undertaken there. Visitors may also recognise Easdale village, as it was the location used to film the film 'Ring of Bright Water'. Experience the grandeur of the mountains of Glencoe on this trip, which also takes in some of the bonniest parts of Argyll. Enjoy beautiful views along the coast in particular the much-photographed Castle Stalker. Take a detour to the pier at Port Appin and enjoy views to Lismore, north Mull and Ardnamurchan as well as excellent seafood from the Pierhouse Hotel. Glencoe and the bleak Rannoch Moor are remarkable and well worth the trip, which is completed as you travel back to Oban on the A85 from Tyndrum.